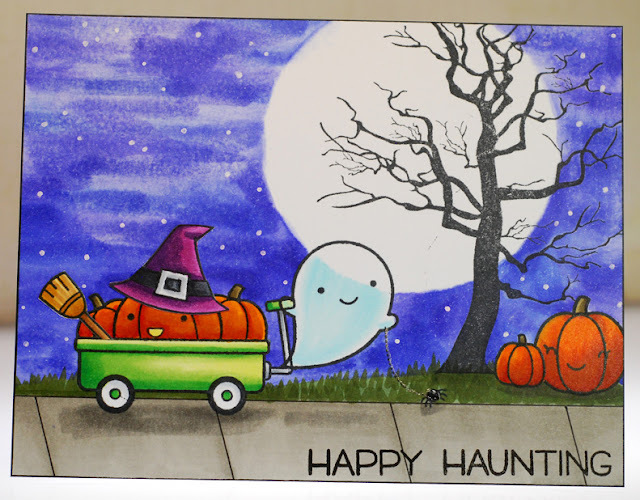 The forecast is calling for rain all day tomorrow but I doubt that puts much of a damper on all the little trick or treaters who will be hitting town in search of candy this year. 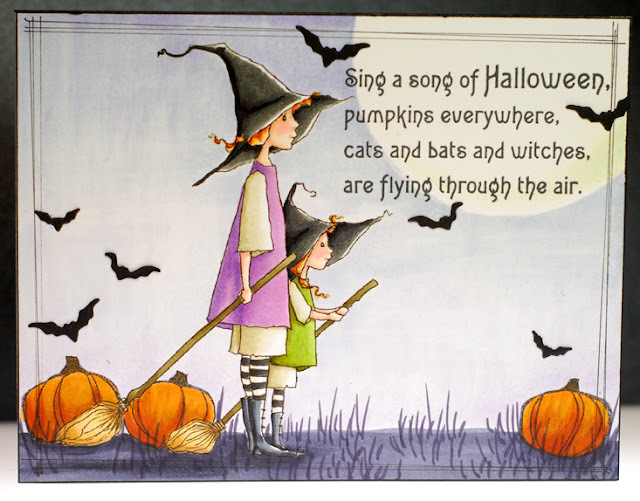 Luckily for me I will be inside with the candy, LOL! 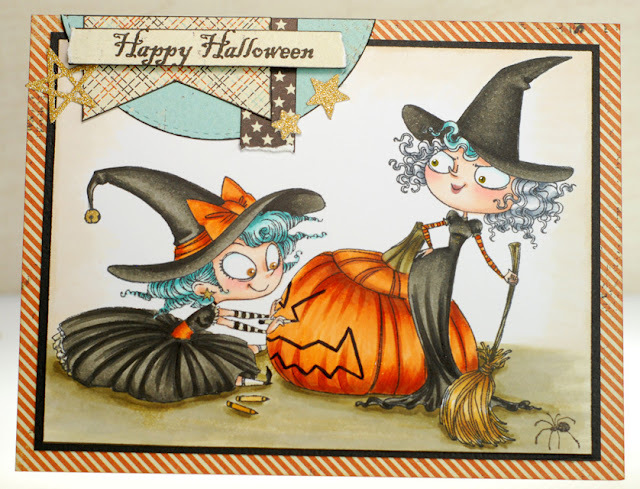 I saved this witchy duo from A Day for Daisies for my final Halloween card of the year because I totally adore them. The digi is called First Flight and it so looks like these little witches are just waiting for that right moment to mount those brooms and take off into the night sky. 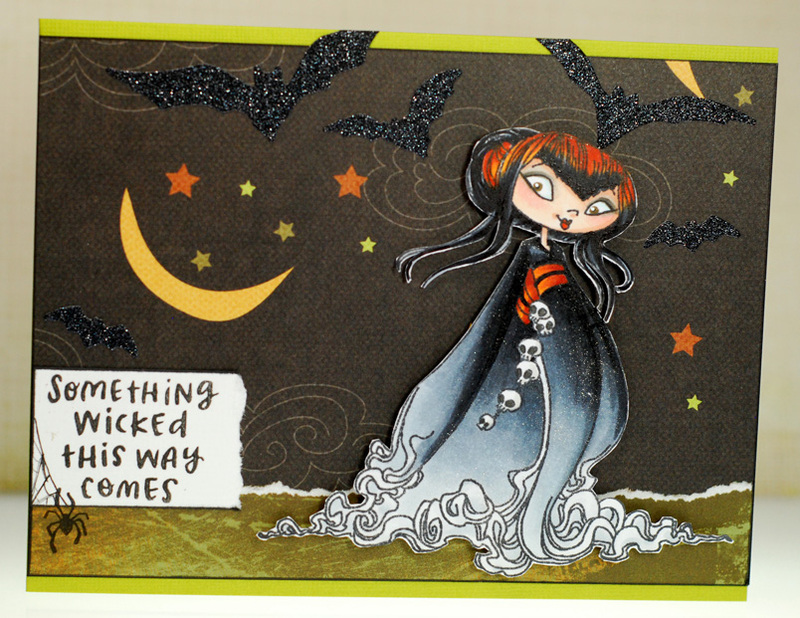 The card is all one single scene that I created with masking and stamping... all except the little bat die cuts that I did add at the end. 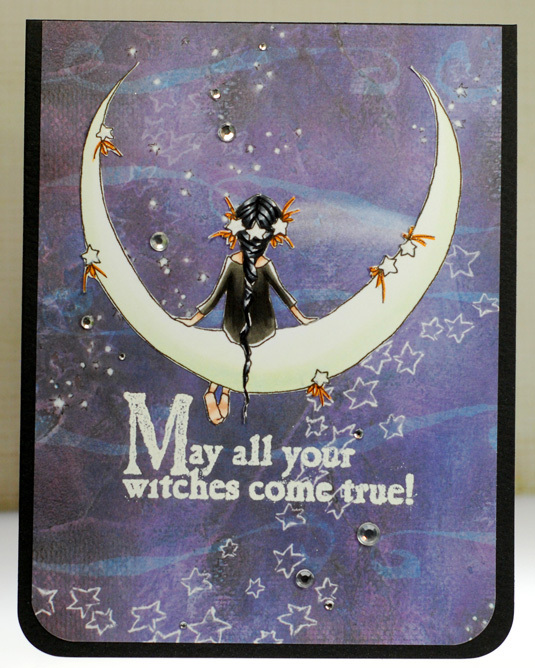 This magical mistress of the night is the Wild Sprout from the TGF Spooky set. Originally she has just the super slicked back hair but I felt like giving her some extra long locks. It was really easy, all I did was draw in a few lines behind her and colored 'em in. 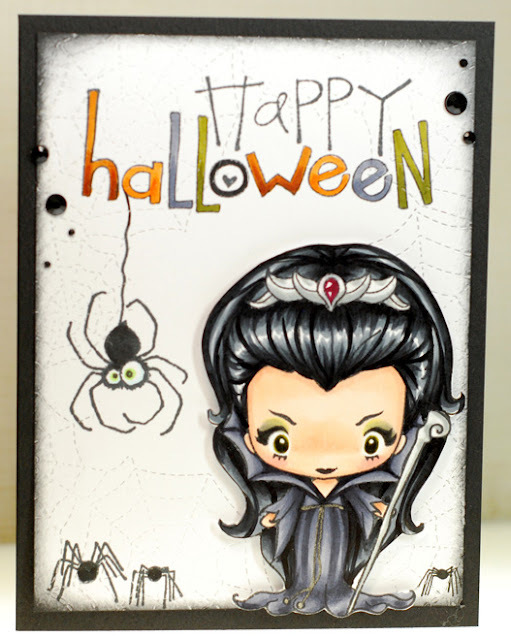 Once I had her all colored up something about her gown had me seeing her as Arachne, Queen of the spiders so I grabbed this cool stitched spider web die and used it all around the edge of the white cardstock. Then I found some fun spider stamps to keep Arachne company. The sentiment is an old Heidi Grace stamp that is great because it gave me the chance to color it any way I wanted. Ok, I've got a long road trip ahead of me today so I should get myself ready. Take care everybody! Alrighty, I'm outta here. Catch ya on the flip side! 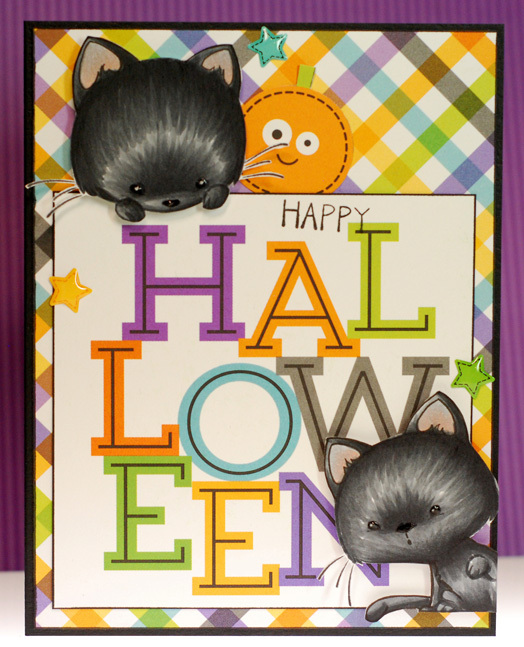 Hope you have a fun and crafty weekend! See ya on Monday! 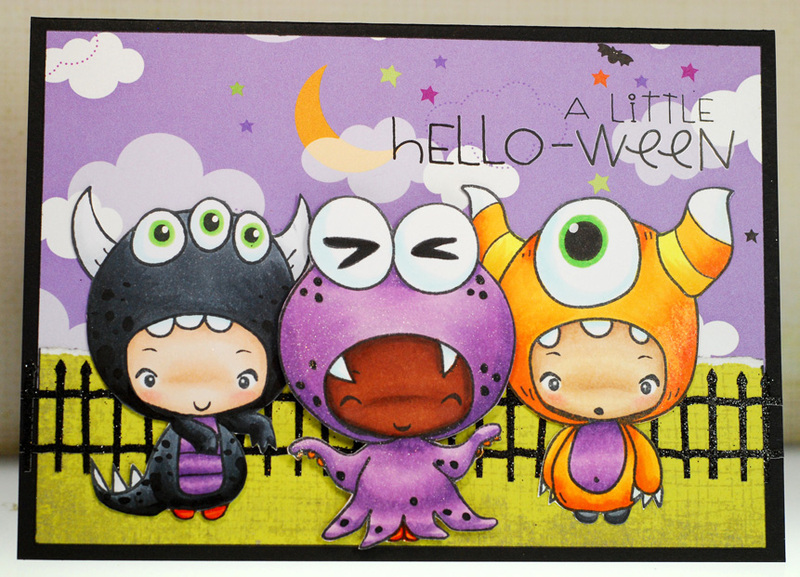 Kraftin' Kimmie Stamps is hosting a Halloween challenge this week so of course I had to play along. The only hard part was deciding on a stamp to use because I still have a handful in my stash that haven't made it on a card yet. Ultimately I settled on Magical Mathilda because I could totally envision the scene she would live in. 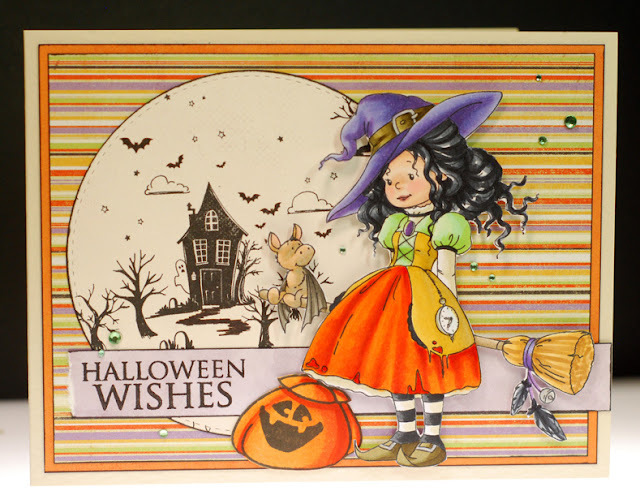 I wanted Mathilda to be practicing her magic in some stately manor room and the papers from the new Pebbles Boo collection were perfect for achieving that look. Doesn't that skull print look like some kind of spooky damask wallpaper? Love it. Of course I pulled all my Copic colors from the paper and I even grabbed a couple of fluorescent Copics which hardly ever get used but man did they create the most perfect mystical glow around her, I wish you could see this one in person. Wow, I was just looking at the calendar and after this post I only have eight more Halloween cards to make before the big day hits. Where did the month go?! Seriously, I know I have more than eight images waiting in the wings so this makes the choosing that much more difficult. Decisions, decisions... luckily for Hazel here she doesn't have to worry about getting on a card this year because her stampy destiny has been fulfilled, LOL! This Whimsy Stamps cutie looks a bit frazzled, like she has had a long Halloween night riding on that broom of hers. Now she has made it back home and all Hazel wants to do is take a nap. The papers I pulled are a mix of new and old and all of the colors in Hazel's outfit come from that great stripe pattern and I am so happy with how close I got to matching it. 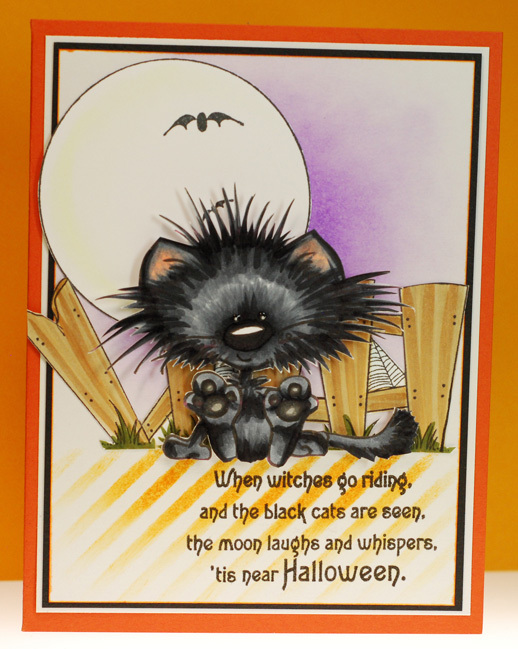 I got this super sweet new Pure Innocence cutie in the mail last week called Thankful Friend, and I really wanted to get her on a card. 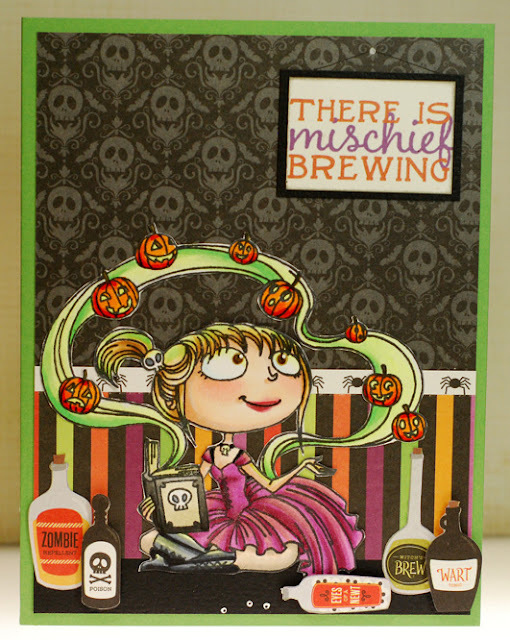 So before I got started I decided to check out the MFT challenge blog to see if there was anything to play along in. 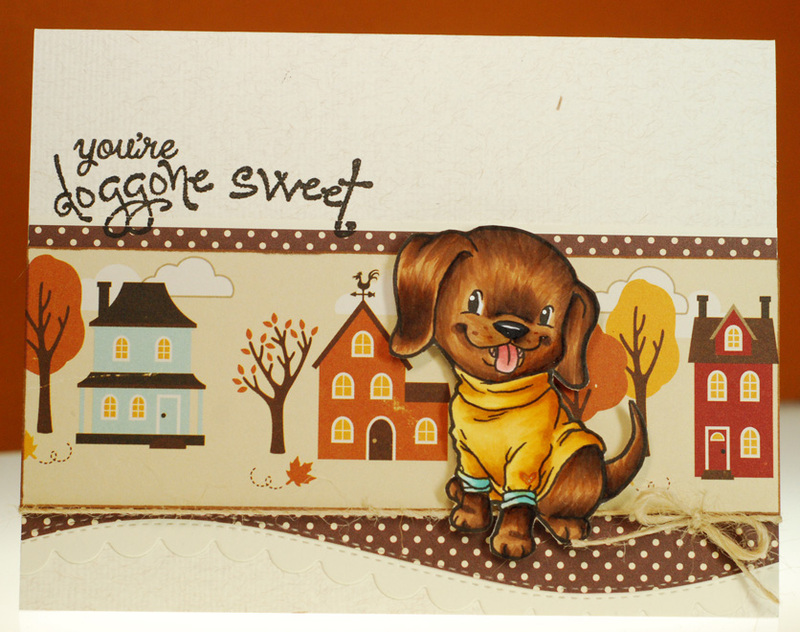 This week's sketch totally caught my eye and provided my with just the inspiration I needed to put this card together. I found this super old scrap of paper in my stash that had a soft watercolor look to it so I tried to keep my Copic color palette soft too. I also pulled out a bunch of dies too which is always great. I have quite a few at this point and I always feel like I don't utilize them as much as I should. 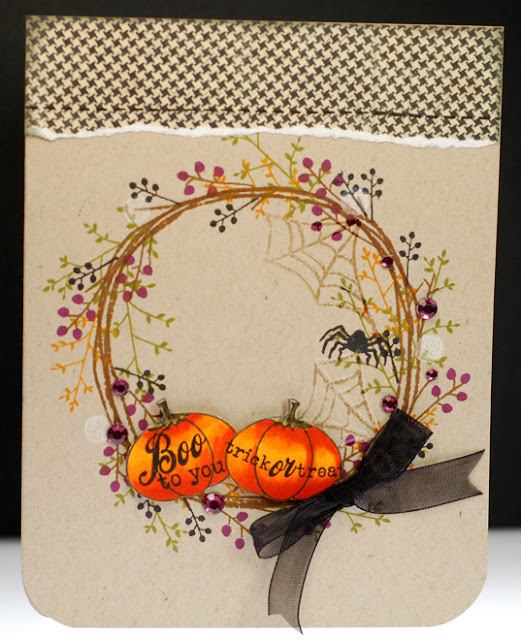 Well I am back in my comfort zone today with this cool spider web paper that I got recently. 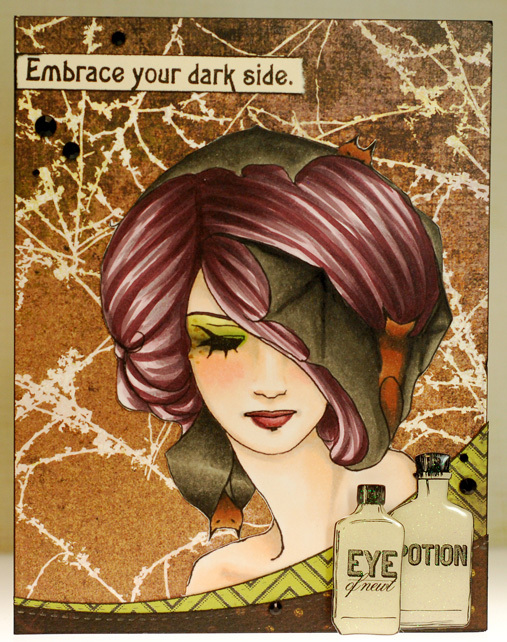 It just might be my favorite print that has been released this year and I've been anxious to get it on a card. But I needed just the right image to pair with it, something elegant and a bit more mature... that is where Cat Hat comes in to play. She's another gorgeous digi from A Day for Daisies and I love how her kitty has snuggled up right in the middle of her billowing up-do. 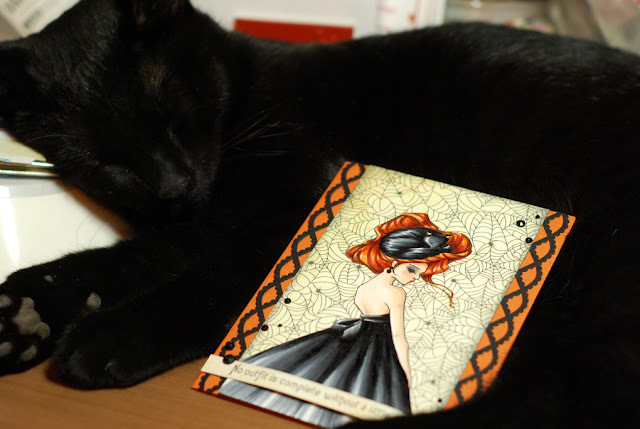 Cat Hat was looking so elegant that I even gave her some bling in the form of some jeweled earrings. 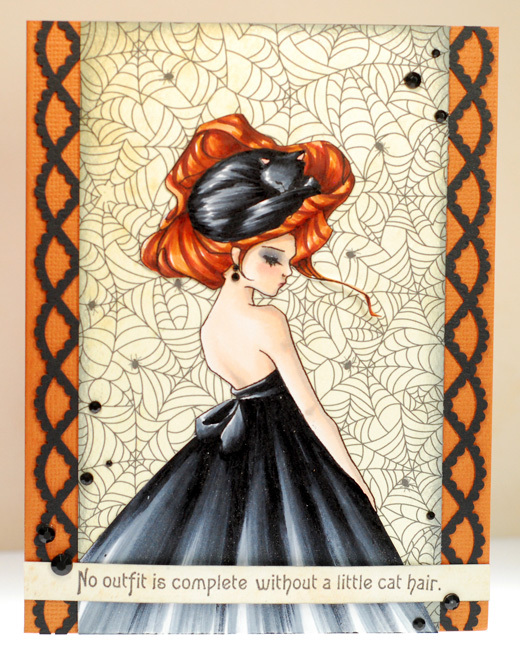 I also dusted off an old Martha Stewart border punch to make some black paper lace so that I could enter this card into the current 'add black lace' challenge over at the ADFD blog. Before I go, I had to share this photo of my sweet Sully because it fit the theme of today's post so well. This is pretty much where he was for the better part of creating this card and he didn't even want to wake up and move when it came time for me to get a pic. 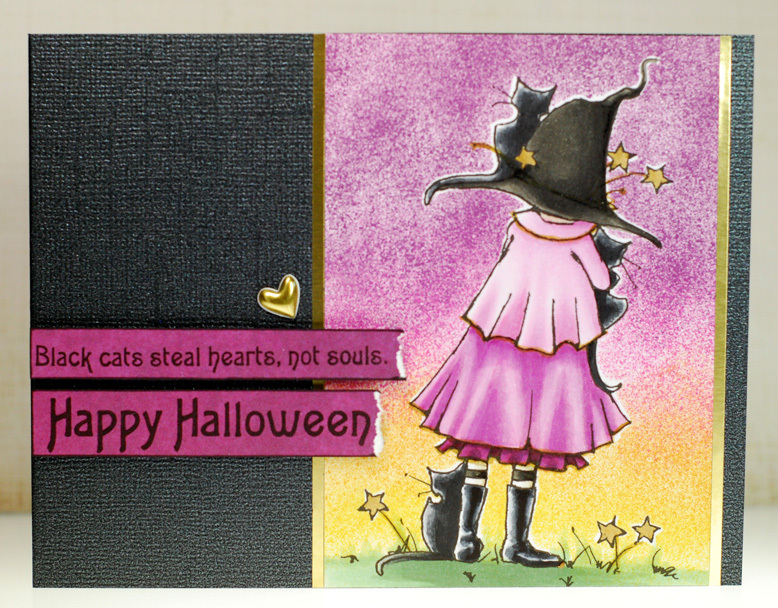 Sigh... Cat Hat knows that once a kitty finds a comfy spot there is nothing to do but let them sleep, LOL! Last week I had pulled out the classic Spooktacular set from TGF and made a card featuring little Pumpkin Head. As I was getting ready to put the stamps back in their binder I was inspired by a couple more of these Halloween cuties to make one more card with them this year. 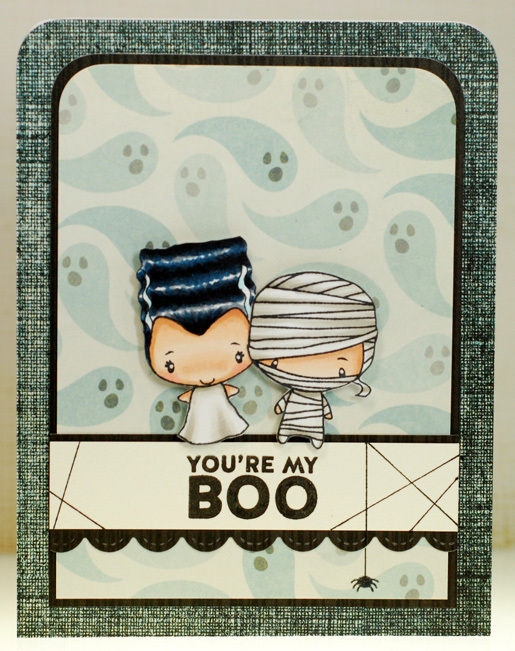 I stamped up Bride and Mummy then paired them up with this fun ghost paper from We R Memorykeepers. Sure the blue and black combo aren't traditional Halloween colors but I think it totally works with these two. 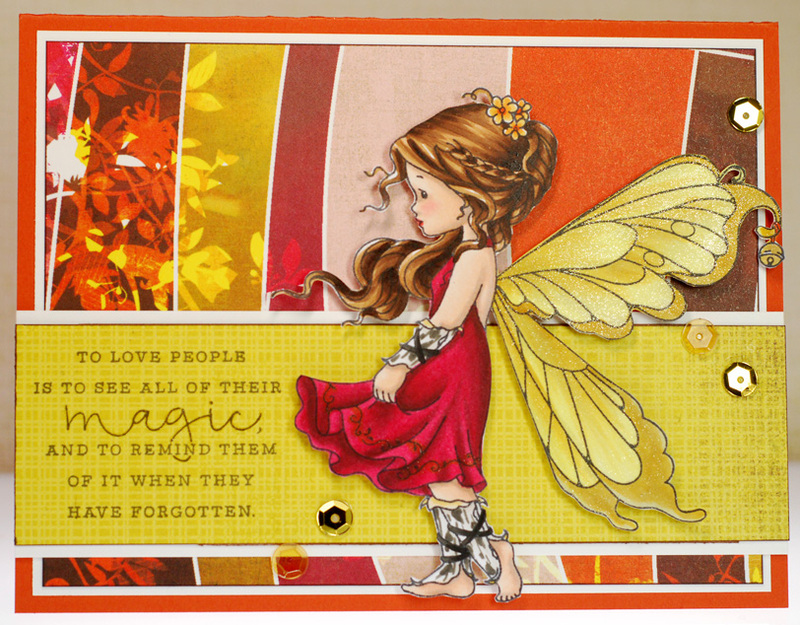 My other inspiration was this sentiment that I got recently and really wanted to get on a card. 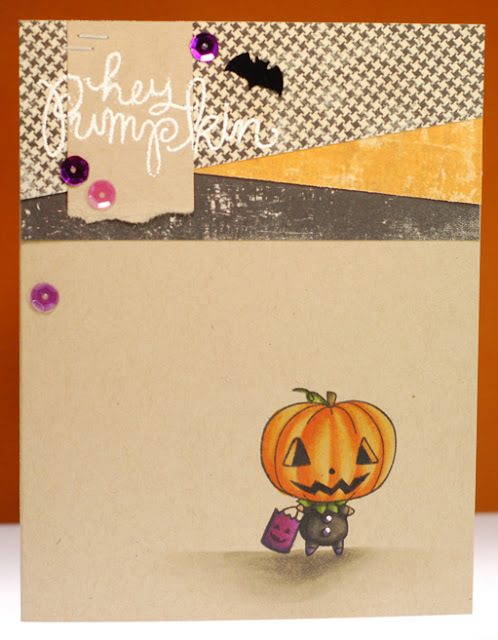 I just think it is such a cute and clever twist turning it in to a Halloween greeting. My only embellishment is a few hand drawn spiderweb lines and the tiny spider from the Lawn Fawn Booyah set. 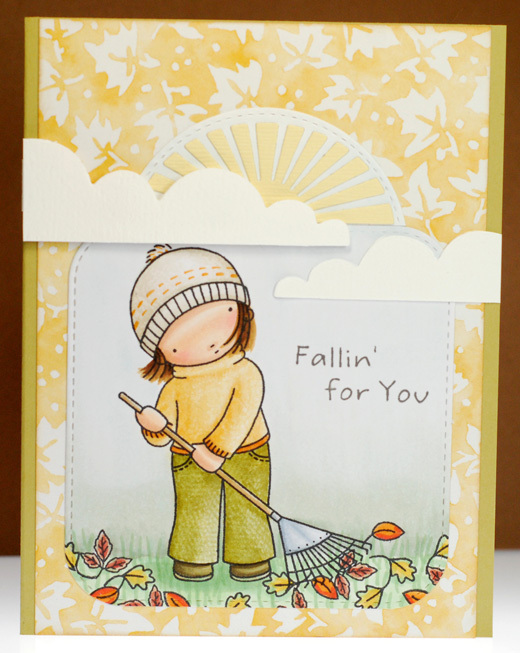 Another simple card but I've kinda fallen in love with it, LOL! 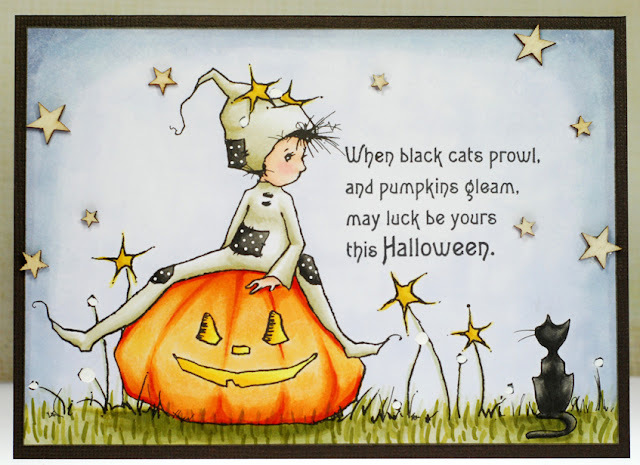 Ok friends enjoy your weekend and I shall see you all again on Monday! Ok, I've got to hurry up and get this day going. Okey dokey friends, time for me to split! Ok friends, hope your week is off to a great start! Ok, I'm off for another fun Friday full of coloring. Well friends I'm outta here. Thanks for stopping by!